Fact: the green beauty realm is home to some serious change makers, who are applying the ethos behind natural products (sustainable, healthy, etc.) to solve real world problems. From companies who support the local communities where they harvest ingredients to those who stand up against animal testing, the vast majority of the green bath, body and skincare products we know and love are championing sustainable business and giving back. Just another reason the green beauty community is unique. And just another reason to LOVE it, and feel great about it. Case in point: Skincando. When Sara from Skincando reached out to us about reviewing her samples, we were pretty psyched – not only because of her all-natural lip balms, creams and anti-aging products, but also because her brand is mission-driven, donating Skincando’s Combat-Ready line of products to troops overseas since 2005 through Operation Sand Flea. 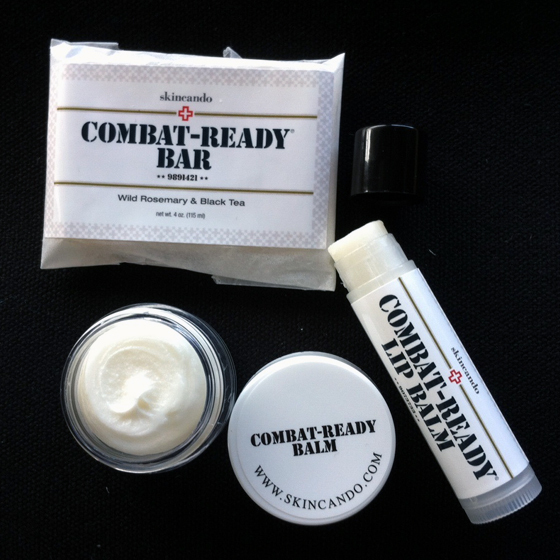 Skincando’s Combat-Ready products are powerful, designed to soothe skin irritated by extreme conditions. And we think it’s pretty inspiring and excellent that Skincando is so dedicated to bringing helpful, natural products to troops overseas. Check it out! The good news for natural product enthusiasts is that between Skincando’s two lines (Combat-Ready and Luxe), we found some products that we love as much as Skincando’s commitment to doin’ good. Read on!